Your conversation history includes all the instant messages you’ve sent to and received from your contacts or groups, as well as details of any calls you've had on Skype. Your conversations are saved on your hard drive for a period of time, which you can specify in your history settings. Learn how to delete or hide your chat history. In the sidebar, the Recent section lists new contact requests, unread conversations and conversations you've had in the last 12 hours (you can change how long chats stay in the Recent section in your settings). Click the contact or group you want to see the conversation history for. Your instant messages and call history with that contact or group are displayed in the main window. To see your older conversations, go to the sidebar and click History. If you can't see the person or group you're looking for, type the name into the Search box. If you're looking for a specific conversation, you can type any part of the conversation into the search box, then click Search Messages. All messages containing the word or phrase you typed appear on the left. Click the one you want to view. How do I find something that's been said in a conversation? If you need to find a particular message within your conversation history with a contact or group, you can search for a specific word or phrase within the conversation. Select the conversation you want to search. Press Cmd + F on your keyboard, or select Edit > Find > Find in the menu bar. In the search box that appears, type the word or phrase you're looking for. When the number of matches is displayed, you can use the next and previous buttons to move through the search results. 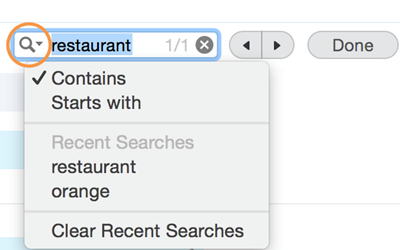 You can also click the search icon and then search for text that starts with or contains a specific word or phrase. If you’ve read a message, but need to remember to go back to it later, just right-click the conversation and select Mark as Unread. This turns the conversation orange in the Recent tab, and adds a notification to the Skype icon in your task bar, reminding you to read it later. How do I change my history settings? 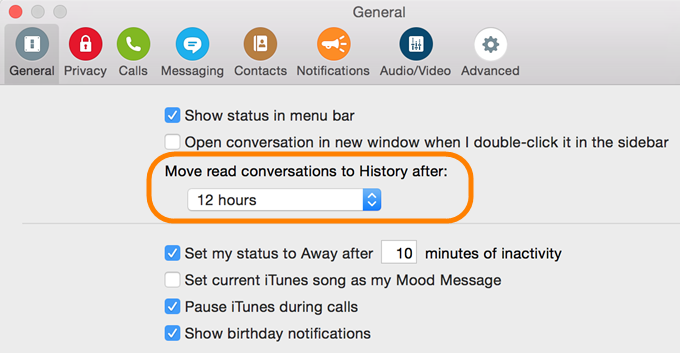 Conversations stay in your Recent list for 12 hours after you've read them, and then they move to History – but you can change the length of time your messages remain in your Recent list. Select Skype > Preferences... and then select General. Under Move read conversations to History after: choose 12 hours, one day or one week. Your conversation history is saved on your computer’s hard drive for a specified period of time. 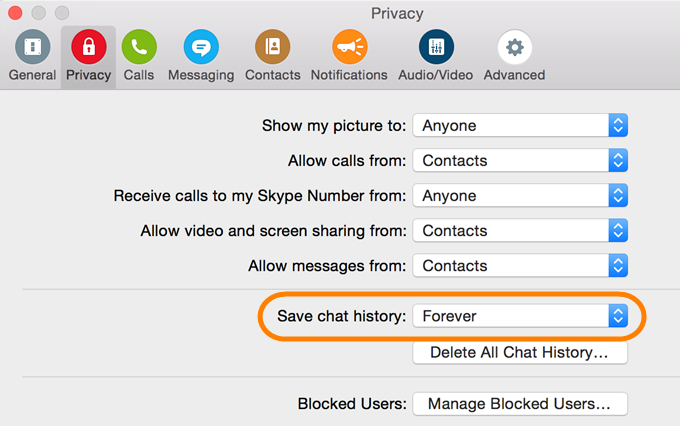 Select Skype > Preferences... and then select Privacy. Next to Save chat history, choose from the drop-down Forever, 1 year, 3 months, 1 month or Never. Can I transfer my instant message history from one computer to another? Open Finder and navigate to ~/Library/Application Support/Skype/. The “~” sign means your home folder. To find your home folder, open Finder and in the main menu, select Go > Home or press Command (Apple) + Shift + H keys. Copy the folder that has your Skype Name, and save it to an external media device. On your new computer, install and sign in to Skype so that the necessary folder is created, then sign out of Skype again. Replace the Skype Name folder with the one that you saved in step 2. Sign in to Skype. Your chat history will be there when you browse through your conversations.